Narin & Portnoo - about as much fun as golf (and life) can get. Without giving you too much information, I just finished a bathroom book I purchased about 18 months ago. I’d read one or two of its 320 pages every ‘visit’, though would often sneak in a third or even fourth page if the kids or wife weren’t yelling for me to come downstairs (I’m an extremely slow reader and there are three WCs in the house which hopefully explains why it took so long to read). Okay, let’s move out of the bathroom now. You’ve probably read Tom Coyne’s ‘A Course Called Ireland’ too. If you have, and if you’ve ever visited the Emerald Isle, there’s no doubt the wonderful prose and absorbing stories bought back happy memories of your own trip(s). Of course, Coyne played and described his rounds at some of the best links courses in the world – well-known venues we’re all familiar with be it through personal experience or photographs in magazines. He tells us about visits to Royal Portrush, Royal County Down, Lahinch, Doonbeg, Old Head, and, for his triumphant finale, the magical Old Course at Ballybunion. Part of the book’s charm is Coyne’s skill at giving us just enough about each course without boring us with accounts of each shot and every hole. As all great travel journals do, it makes you want to get on a plane and see, feel, touch, smell…and drink, the same stuff he did. Everyone will have his or her favorite pages - likely those that correspond with their visit to the course/town/beach/B&B/pub Coyne stopped at. 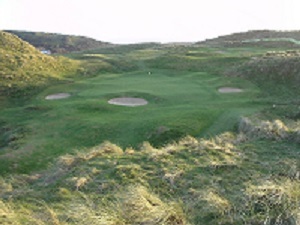 For me, it was the short but gratifying tales of days at two utterly captivating (but largely unknown) courses – Laytown & Bettysown, and Narin & Portnoo – that took me momentarily back to Ireland and had me imagining warm, breezy days on the links followed by cold, delicious pints in welcoming clubhouses. The night before my first visit to Laytown and Bettystown, Princess Diana had died in a Paris car crash. The club secretary who greeted my friends and I was virtually in tears and wondered if we wanted to postpone our round for another day (for an Irishman to show such grief over the death of a member of the British Royal Family took us by surprise). We couldn’t reschedule though, so walked the 100 yards or so out to the 1st tee with the secretary who, barely consolable, gave us a little history of the course, pointed us in the right direction, and wished us a pleasant round. I’ll be perfectly honest, though initially shocked and upset, we never thought about the Princess’s passing until later that evening after having enjoyed 18 splendid holes. I remember Narin not only for its honor box and beautifully natural layout, but also for the fact that five minutes after walking up the 9th fairway basking in glorious sunshine my friends and I were huddled together on the ground beneath the sturdiest of our umbrellas trying to survive a fleeting storm on a Biblical scale that left us soaked and shivering, not to say dazed and confused. Next time you take your sticks to Ireland, save a couple of days for courses you may not have heard of before, but which you’ll remember for the rest of your life.